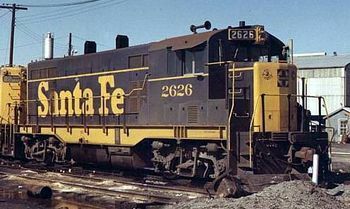 Santa Fe #2626 (former F3 #22C) wears the blue and yellow "billboard" livery. The unit's original F-series cab windows have been replaced, and the rear pane blanked out. The rounded cab roof was retained on this unit, but later examples had more angular cabs. A CF7 (simply put) is an EMD "F" unit diesel locomotive that has had its streamlined car body removed and replaced with a custom-made, "general purpose" body in order to adapt the unit for road switching duty. All of the conversions were performed by the Atchison, Topeka and Santa Fe Railway in their Cleburne, Texas workshops between October 1970 and March 1978. The program was initiated in response to a system-wide need for more than 200 additional four-axle diesel "hood" units to meet projected motive power demands on branch lines and secondary main lines. Santa Fe's aging fleet of 200-series "F" units were in dire need of overhaul, and were not suitable for switching service in their original configurations due to the poor visibility resulting from their the full-width carbody; the engineer was required to stick his or her head out of the window in order to see the end of the train or locomotive when coupling and uncoupling cars. As new, state-of-the-art locomotives cost upwards of $150,000 each at the time, Santa Fe elected to experiment with modifying its existing "F" units to serve their purpose, which they hoped they could accomplish for around $60,000 each. Changes in business philosophy led the company to sell off its entire CF7 inventory by 1987, with all but 9 of the units ending up in the hands of regional and short-line railroads, and a few excursion lines. A small number remain in service today. The first locomotive to go through the "Converted F7" Program was Santa Fe #262C, an F7A cab unit that entered the Cleburne shops in October, 1969. The unit was stripped down to bare metal, its sleek car body removed and scrapped. Unlike hood units, cab units were structurally supported by their car bodies, so a new underframe had to be constructed. Next, a new road switcher car body complete with walkways was manufactured and installed, along with numerous other upgrades traditionally associated with a comprehensive overhaul, including re-manufactured prime movers, trucks, and traction motors (rebuilt at the San Bernardino, California shops), refurbished electrical systems, and enhanced brakes. #262C was the only CF7 conversion ever equipped with dynamic brakes, which were parted-out from the long hood of wrecked GP7B #2788A. In order for the salvaged hood to fit, some 7" had to be removed from the bottom of the hood where the it connected to the main frame and the running board (all other units had long hoods fabricated from scratch by the Cleburne shop forces). A new rounded-roof and low short hood were constructed, and a new control stand installed. To increase versatility, the unit could operate in either switching mode or road service mode. All CF7s were configured with an AAR B-B wheel arrangement and ran on two Blomberg B two-axle trucks, with all axles powered. All but one CF7 utilized the F-units' sixteen-cylinder EMD 567 series diesel engines as their prime mover, progressing from model 16-567B through 16-567C (#2452 was tested with an EMD 645 series turbocharged engine, which produced 2,000 horsepower — however, the greater availability of parts for the 567 series, coupled with the perception that CF7s would be engaged primarily in switching duties, resulted in the original motors being retained). The engines were removed from their frames, completely dismantled and rebuilt, then reinstalled. Santa Fe #2509, a rounded-cab CF7, pauses in front of the depot at Santa Ana, California in 1976. Santa Fe CF7 #2492 as seen at the Bakersfield Roundhouse in 1976. Most units converted beginning in 1973 had air conditioning systems installed at the Cleburne facility; eventually all CF7s received cab air conditioners. Nos. 2649–2617 came out of the shops wearing Santa Fe's "billboard" paint scheme, while Nos. 2616–2417 were decorated in the Yellowbonnet livery. It is not clear why the Santa Fe chose to issue road numbers for its CF7 units in descending order. The CF7s worked within all segments of the Santa Fe system. While most saw action switching cars and transporting local freight, others could be found in multiple unit consists hauling mainline drags. The units distinguished themselves working on potash trains between Clovis and Carlsbad, New Mexico; Nos. 2612–2625, all equipped with remote control equipment (RCE), were typically "mated" to road slugs (converted cabless F-units). CF7s also powered grain trains across the Plains Division. 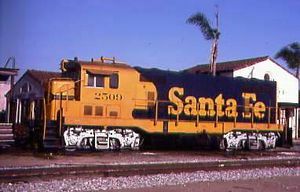 The Santa Fe had planned in the mid-1980s to renumber its CF7 fleet from 2649–2417 to 1131–1000 and repaint the units in the new "Kodachrome" paint scheme, all in preparation for the upcoming Southern Pacific Santa Fe Railroad (SPSF) merger. However, the Interstate Commerce Commission (ICC) subsequently denied the merger application, and no CF7s were decorated in the new livery. 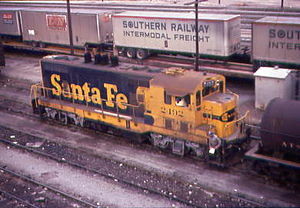 Changing philosophies regarding motive power expenditures led the Santa Fe to begin trimming its CF7 roster in 1984. The majority of the locomotives were sold for as little as $20,000 to short-line and regional railroads such as the Commonwealth Railway and the Maryland and Delaware Railroad (6 were involved in wrecks and 3 others sent directly to the scrap yards), though Amtrak and GE Transportation Systems were among the major initial purchasers. By 1987, the Santa Fe had divested itself of all of its CF7s. At least one unit has been restored and preserved at the Kentucky Railway Museum, the first such organization to add a CF7 to its locomotive roster. Ironically, #2649 ended its days on the rails by contributing some of its parts toward the rebuilding of two F3 units owned by the Anthracite Railroads Historical Society. The Santa Cruz, Big Trees and Pacific Railway, a popular California heritage (tourist) railroad, owns and operates two CF7s. This page was last modified 06:10, 17 December 2013.